You can now buy Dolavs online directly from our UK warehouse – it’s easy and fast! Stock available from our Watton warehouse. Everything that is on the shop is directly from our stock so can be delivered within a few days. Browse for plastic pallet boxes in ten colours and accessories including lids in 7 colours. Choose between our ACE model, Type 800, and our new DFLC, with lids to match. The Dolav folding ACE (DFLC) is designed to be hygienic and heavy-duty. It stacks, tips, folds and holds 750kg in 600 litres. It follows "hygienic design" Campden BRI. 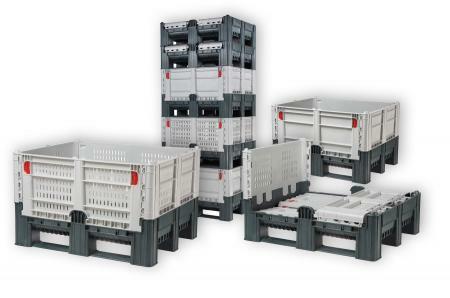 Anti-slip corners assist safe stacking with ACE and Classic Dolavs.